A simple solution and some creative engineering were all it took for Jim Schultz to sell his product to MasterCraft Boats. Now, the luxury boat maker and this Lake Zurich manufacturer are charting new waters through a series of creative, innovative products. 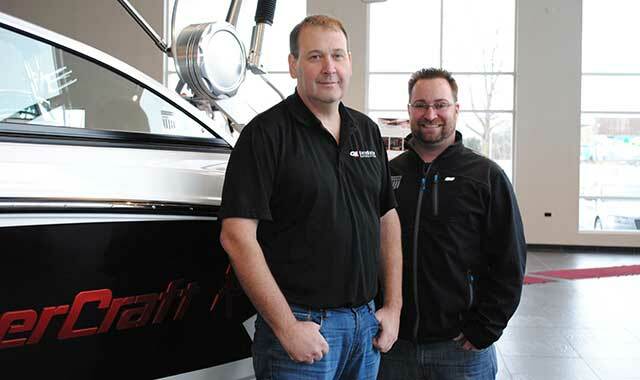 Jim Schultz (left) started GereMarie and MasterCraft Boats of Chicago when opportunity knocked. Tret Robertson toured Europe with a boat racing crew before joining the MasterCraft dealership in Lake Zurich in 2011. Looking at that expensive wakeboard rack, Jim Schultz knew he could build a better product at a lower cost. His engineer’s mind was racing. At the time, Schultz was just three years into his hobby-turned-business running a suburban job shop. The boat dealer was so impressed with Schultz’s improved product that he contacted Tennessee-based MasterCraft, a builder of high-end wakeboarding and surfing boats. When they saw what Schultz could do, they wanted in. For the past 16 years, Schultz and his team at GereMarie, 1275 Ensell Road, Lake Zurich, have built a powerful relationship with MasterCraft. Not only does GereMarie manufacture every aluminum part that goes on a MasterCraft, it’s also Chicagoland’s only dealership, one that’s become a flagship location for every other dealer in the U.S. But that’s just the start of this dynamic company with 150 employees. With nearly 30 clients in addition to MasterCraft, Schultz is pushing the limits of manufacturing technology and dreaming of the next big thing. Watch a MasterCraft boat jet across the water, and you can quickly point out the components made in Lake Zurich: big pieces like the tower, along with its wakeboard racks and aluminum speaker housing, and finer details like dashboards, throttles, glove boxes and handles. Each one bears the mark of GereMarie precision, with a “brushed chrome” look and ridged metal that bears the MasterCraft logo. Step into the MasterCraft Boats of Chicago dealership, located inside the GereMarie complex, and you’ll see that same branding repeated elsewhere, from the overhead speakers to the product stands. Shiny aluminum cutouts of the MasterCraft logo double as door handles, and tower frames double as standing desks for employees. You’ll even spy aluminum steps leading to the pro shop upstairs and metal frames that serve as balcony railings. All of it’s made a few feet away. “We’re trying to get product stands and other things to a point where you can walk into a MasterCraft dealership somewhere else, and you know you’re in a MasterCraft dealership,” says Tret Robertson, general manager of MasterCraft Boats of Chicago. You’ll find customers here from all over Illinois and Chicago, from Interstate 80 to the Wisconsin state line. The 20,000 square-foot, full-service dealership comes with a showroom and service center. A variety of boats, all manufactured in Tennessee, are on display. Come summertime, some will head to the local waterway for product demonstrations. The service department specializes in inboard motors, particularly the Indmar and Ilmor engines found on MasterCraft boats. The inboard motor is a signature for MasterCraft and makes these boats specially suited for wakeboarding and wake surfing. Because the average watercraft is 20 to 26 feet long, they’re commonly found in the Fox River, Lake Geneva, and some of the Tennessee lakes near MasterCraft’s world headquarters. Technology has always captivated Schultz. In fact, it was a high-tech CNC machine that first drew him into manufacturing, as a hobby, in the 1990s. The level of automation at GereMarie’s 120,000 square-foot production center is truly a marvel. The centerpiece of this plant is a series of flexible manufacturing systems (FMS) – an entirely automated process that’s hidden behind black-and-white metal paneling. Robots inside do all of the work. Schultz says his is one of the largest such systems in North America. Near the loading dock, one robot controls inventory for the first manufacturing process. It feeds a series of automated CNC milling machines. Further down the line, several people are recalling inventory from the FMS, either inspecting it, machining it or sending it to an assembly team. Nearby, teams of workers are operating CNC machines as they create aluminum speaker housing. Raw bars of aluminum are sawed down to shape and then inserted into a CNC, which mills down the speaker into a conical shape. The machine also carves out a ridged texture and the MasterCraft logo. From the CNC team, parts are inspected and sent for additional work. At the sanding station, workers smooth out any rough edges. This is also where the “brushed chrome” look is imparted on the metal with a giant sander. From there, parts head for the anodizer, which weatherproofs the aluminum and protects it from damage by salty seawater. Next to the anodizer, an automated storage returned system (ASRS) collects more inventory. On the left side of the ASRS, a young woman loads aluminum parts, wrapped in brown paper, into a container. A bar code on that container tells the ASRS exactly where it’ll go. She pushes a few buttons and the system grabs the box, then zooms toward an opening on the shelf. To the right side of this machine, a young man recalls another box, which he’ll send to the assembly team. Near him, crews build boat towers and piece together additional components. Building this highly automated factory was no easy feat. Schultz says it took eight engineering designs and about four years to bring this production center to life. Its use helps to eliminate nearly 90 percent of inefficiencies. Schultz bought his first CNC machine in late 1996. The mechanical engineer figured he could do odd jobs by night, but he also dreamed of someday manufacturing his own original product. The more Schultz learned about the business and acquired clients, the longer his days became. Eighteen-hour days, 20-hour days, all-nighters. By 1999, he had enough clients that he could quit his job, move to Lake Zurich, and open a 3,000-square foot job shop – just enough space for three machines and his two employees. In what little time he could get away, Schultz spent it waterskiing, which he’d done every summer from a young age. It was on a visit to his longtime MasterCraft dealer in Michigan that he pitched a business partnership. The dealer showed him a wakeboard rack that retailed for $900. It cost the dealer $700 wholesale. Schultz knew he could make the same product at a much lower cost. The dealer, Jerry Brower, was so impressed that he showed it off to MasterCraft. Schultz braved the storm and spent the weekend pitching a MasterCraft representative on multiple product ideas. He promised to stay in touch with Schultz. Several months went by. Job shop work slowed down. Competitors started moving overseas. MasterCraft sounded indecisive. Throughout the 2000s, GereMarie grew as it acquired ever more contracts for MasterCraft’s aluminum components. Around 2010, management approached Schultz about expanding the relationship. Would he be interested in opening a dealership, they asked, perhaps building something near an area lake or on a major roadway? Schultz countered with a unique plan: put the dealership in the same building as his growing manufacturer. They agreed, so Schultz moved GereMarie to its current location. He opened the dealership, then spent about four years assembling the manufacturing infrastructure. The resulting combination has become a showroom for GereMarie’s talents and a source of pride for MasterCraft executives. In 2011, general manager Robertson joined GereMarie and the Chicago boat dealership. No stranger to boats, Robertson toured Europe as an electrical engineer with the Lucas Oil boat racing team. The lifelong boater now provides a critical bridge between the dealership and the manufacturer. Schultz has built a solid relationship with MasterCraft, who now hires GereMarie to make every aluminum component inside its boats. Nearly half of those components start inside GereMarie’s engineering studios, where a small team of designers continue to push the envelope. Though it’s built a solid relationship with MasterCraft, GereMarie maintains a variety of other customers and products across industries. It serves Polaris’ motorcycle division, truck manufacturers, Cigarette racing boats and Skeeter fishing boats. It produces roadway lighting systems and photovoltaic panel racks. It’s even working with a fitness company that makes swimming pool exercise equipment. Accomplishing that growth will be no small challenge. But Schultz, the intrinsic engineer, just sees another puzzle that begs to be solved. This entry was posted on Wednesday, May 18th, 2016 at 12:00 pm	and is filed under Northwest Business Magazine, Top Posts. You can follow any responses to this entry through the RSS 2.0 feed. Both comments and pings are currently closed.